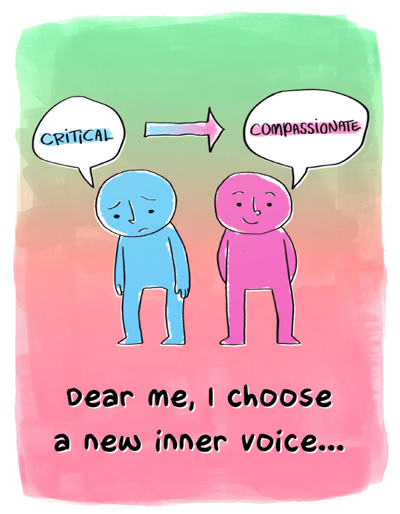 Do you know your inner critic? If you look at these statements, which can vary depending on your particular experience, you may be able to remember where they came from. Frequently, they come from parents, family members and teachers, or people who were authority figures for you when you were younger. As children, you accept what these authorities say. Statements such as these then become part of who you think you are. As we grow up, we find out that we are much more than our minds. We are multifaceted beings. We come to appreciate more parts of ourselves, like our emotions and our talents. But we can still feel imperfect in some ways, like we have missing parts of ourselves, places where we don’t measure up. This can be likened to feeling like a piece of Swiss cheese looks; the holes being the parts of us that we may feel are totally lacking, even causing a feeling of being incomplete. We may just feel bad at times, unaware that the inner critic is actually telling us something that has become so internalized that we can’t even hear the emotionally triggering statement anymore. Tracing the feeling back, and looking at the context of when and in what situation the bad feeling arises, gives clues to its origin. Most of the time, the situation mirrors another traumatic experience from earlier in our life, and the feelings arise again, just as they did the first time. As an example, Maria is 10 years old, and she’s scolded severely by both parents because she received a mediocre score on her school essay. They seem furious because, as they say, she didn’t try hard enough. As an adult, she gets very anxious whenever she needs to turn in the news articles that she writes, to her editor. She has no idea why. She has always been a great writer, ultimately excelling in school and winning writing awards. Despite all her meticulous, top-notch writing, she experiences anxiety as she approaches the end of each writing assignment for the newspaper, sometimes needing to push through procrastination to finish her work. At a family picnic, Maria’s older brother reminds her of the time she was reprimanded by both parents for that poor grade on her essay when she was 10. It triggers her memory, and she re-lives the pain of that encounter. A day later, back at work, the pieces come together for Maria, and she understands why she reacts with so much anxiety to having her articles edited. She has come full circle. Sometimes, realizing the connection to the traumatic event is all that’s needed to disrupt the stimulus/response mechanism. Sometimes, there’s a bit more work to be done. But the circle can be broken, and healed. One way to deal with the inner critic, once we are aware of the connection of the present event to the original trauma, is to love it. Yes, LOVE the inner critic. Why? Because the inner critic is part of YOU. It’s the part of you that is watching over you so that you don’t get hurt again. It’s the part of your mind that remembers the painful things of your past and, for self-preservation, reminds you to look out for them again. And it doesn’t just grow up and stop warning you when you learn to care for yourself! Sadly, those inner recordings keep right on offering their “guidance.” They become habitual thoughts, tormenting some people more than others. So how can we love our inner critic, when it’s being such a bully? When it shouts an untrue or fear-provoking statement at us, we can say, “I know you’re trying to protect me. Come over here and let me love you.” Then imagine hugging it, and say “I love you, inner critic. You’re trying so hard. I love you.” Put your hand on your heart, if you’d like, while you say it. It really works. And with consistent use, you will have less of these intrusive, critical thoughts. Love truly does conquer all. This Valentine’s day, I invite you to fall in love with all the parts of you, and find more inner courage and power. I have done this inner work on myself and with my clients. It’s healing and I love it!